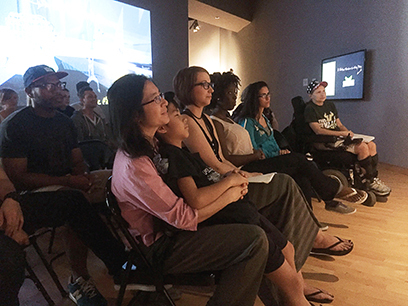 TAMPA, Fla. -- In response to the exhibit "A Family Affair" at the USF Contemporary Museum of Art, University of South Florida English Professor Ira Sukrungruang's undergraduate poetry class read ekphrastic poems alongside MFA students on Oct. 26. Curated by Megan Voeller, the exhibit uses mediums ranging from photography to animation to explore themes of identity and family and runs through Dec. 12. Students' poems engaged with the complex social frameworks represented in the exhibit, providing unique and varied perspectives. The event brought together a crowd of fifty audience members, many of whom also toured the exhibit. Sukrungruang ended the reading with a note of encouragement that viewers of "A Family Affair" be inspired to write their own response poems.